Help us find the next creative SPECIAL.T! Tea, the second most popular drink in the world next to water, has been a very popular choice of beverage around the world. Some people love the taste, ritual and experience, some believe that it is natural and healthy, while others find its cultural component intriguing. For those who are always looking to find moments for themselves to focus and wind down, a new way was invented to enjoy the art of tea – a tea machine called SPECIAL.T. It is the pioneer of the premium portion tea system, using capsules to protect delicate tea leaves with precious aromas from humidity, air and light. SPECIAL.T provides more than 35 exceptional teas, infusions and rooibos to be consumed at different moments of the day. It allows people to enjoy the pleasure of tea tasting, as convenient as tea bags but as good as loose-leaf teas. Each recipe is designed for a specific benefit and comes with a unique discovery story. 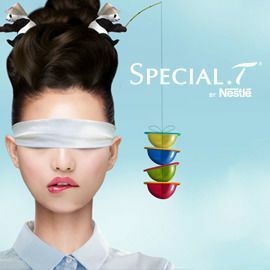 In addition to being the pioneers of the tea capsule system, SPECIAL.T also pioneered the creation of unique and original tea blends that are exceptionally creative and indulgent. Can you help create a new flagship SPECIAL.T recipe?